A Very Rare Cable using the P&D-Analog Connector. This Connector is shaped a little differently then a standard P&D-D or M1-DA Connector. Its more Trapezoidal in Shape. This Forces the User to Use the Analog type Cable. Most Likely Because the Side that has the P&D Analog only supports Analog Signal. 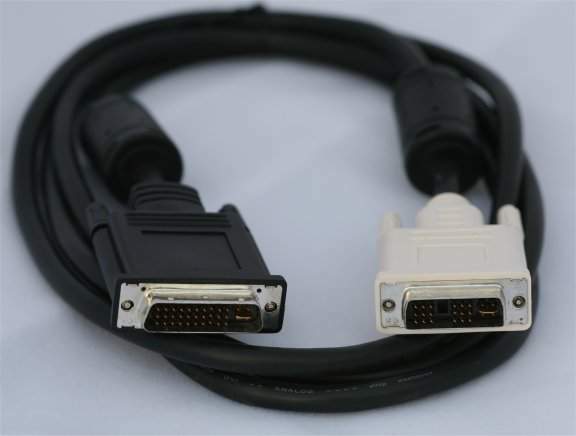 We have this to DVI-A which can be converter to VGA with a DVI-A Female to VGA-M Adapter. Another Cable that is impossible to find. We have a small batch of these.